Improve efficiency and reduce costs by combining labels and forms. There are three basic methods to combine a business form and label material into a single product. 1. Twin Web Products – Produced in continuous or cut sheet formats. A dual-web construction consisting of a paper portion and a label material portion joined together to form a single ply. For a continuous form, both materials have a depth equal to the form depth and a width less than the overall form width. A twin-web cut sheet has both materials running either the full depth or the full width. 2. 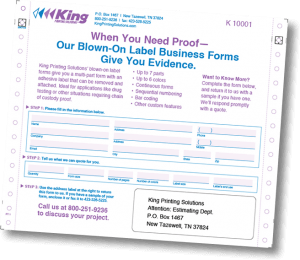 Form with a Blown On Label – Used with continuous or snap-apart forms. An affixed (or blown-on) label or group of labels that can be located anywhere on the face of the first part of a continuous form or the last part of a snap-apart form. Ideal for chain of custody applications, such as drug testing. 3. Label Material as a Form Part – Used with continuous or snap-apart forms. Label material can be used as any part (or ply) of a continuous or snap-apart form.